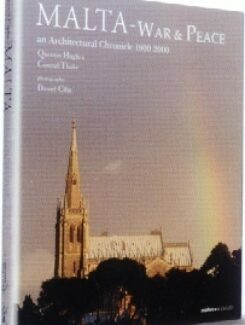 Malta War & Peace – An Architectural Chronicle. ISBN: N/A. Categories: Tourist & General, Melitensia. 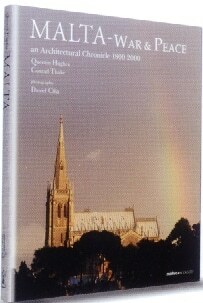 A comprehensive survey of Malta’s architecture in the last 200 years. This book follows logically from the definitive initial publication by Dr Quentin Hughes and Dr Conrad Thake, Malta: The Baroque Island which surveyed the buildings from the Mannerist and Baroque periods (1530-1798) which adorn the Islands. Malta: War and Peace is different and takes up the story of the more recent architectural heritage, bringing its history up to the millennium in the form of a colourful gazetteer. For most of the two centuries covered in this book, war and military warfare were major themes that conditioned the built environment in Malta. Local architectural history has to be viewed against an unfolding canvas where the threat of military hostilities was a major preoccupation. It was only during the second half of the twentieth century that the prospect of war receded from the shores of the islands. Hence the theme ’war and peace’ is deemed to have greatly conditioned the destiny of this small island-state. It is in many respects the prime generator of the built environment during this period. Once again the outstanding photographs taken by Daniel Cilia embellish a publication that documents and does justice to the richness of the architecture of the post-Renaissance Modern period. Authors: Queentin Hughes & Conrad Thake.